In Spain, there is Cava. Cava is a Spanish sparkling wine made using the traditional méthode champenoise. The process and quality of Cava is defined by the Vino Espumoso de Calidad Producido en una Región Determinada (VECPRD). First known “Champaña,” it originated in the Catalonia region at the Codorníu Winery in the late 19th century. The term “Cava” was adopted in 1970 in reference to the underground cellars or “Cava” in which the wines ferment and age in the bottle. The phylloxera epidemic of the late 19th century, which caused the destruction and uprooting of vineyards planted with red grape varieties, kick started the cava industry. The success of Codorníu encouraged vineyard owners to replant with white grape varieties such as Macabeo, Parellada and Xarello to use for sparkling wine production. These grapes are still the primary grapes of Cava today. You will also find some which use the traditional Champagne grapes of Chardonnay and Pinot Noir. So how do the bubbles get there? The grapes are harvested and a white wine is produced. Several types of wine may be blended. Three grape varieties native to Spain are Xarello, Macabeo and Parellada. Tirajo is the second step - The bottle is filled with the blended wine, then a syrupy mixture of yeast and sugars is added, called licor de tirajo. The yeast causes a second fermentation to occur in the bottle. The bottled wine is then transferred to the cellar with a temporary stopper. During the secondary fermentation, yeasts convert the sugar to carbon dioxide (which creates the bubbles). This second fermentation and bottle aging lasts for nine months at a temperature between 55 and 59 degrees Fahrenheit/ 13 to 15 Celsius. During the second fermentation, the bottles are turned occasionally. This process is called remuage. In many wineries this is still done by hand. The turning of the bottles causes the residue to collect in the neck of the wine bottle. Only the neck of the bottle is frozen, which forces the sediment out. The bottle is re-corked immediately. 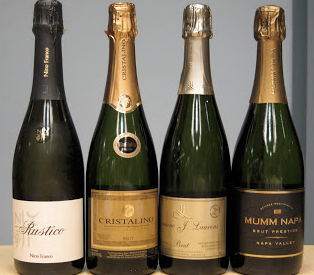 In 1991, the European Union specifications were implemented to make sure that there was a consistent quality standard for Cava. A star with four-points is printed on the base of the cork of any true cava. Cava should be served at temperatures between 46°F and 48°F to best enhance the flavor and bubbles. As always, experiment and drink responsibly. A su salud.